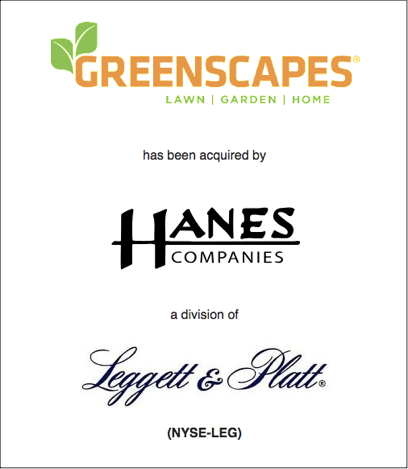 FourBridges Advises Greenscapes in Sale to Hanes Companies, Inc.
CHATTANOOGA, Tenn. (September 26, 2018) — FourBridges Capital today announced that Hanes Companies, Inc. has acquired Greenscapes Home and Garden Products, Inc. Hanes is a division of Leggett & Platt (NYSE: LEG), a $3.9 billion revenue company with a market capitalization of $5.9 billion. Based in Calhoun, Ga., Greenscapes designs and sells innovative home and outdoor products, including landscape fabric, edging, frost protection, bug zappers and bio-fuel products. The company markets to Lowe’s, Home Depot, Wal-Mart and other big-box retailers. FourBridges Capital — an investment banking firm that helps business owners sell their companies, refinance debt or access growth capital — acted as exclusive advisor to Greenscapes. Charlie Hartman with Maynard, Cooper & Gale, PC acted as legal counsel to Greenscapes. Hanes Companies, Inc. is a diverse supplier, converter and distributor of a variety of products and services in multiple markets across North America and Europe. With over 90 years in the industry, Hanes provides a wide spectrum of woven and non-woven industrial materials to end markets including automotive, bedding, building products, furniture, geosynthetics, landscape and packaging. Leggett & Platt was founded 135 years ago and operates 14 business units and 120 manufacturing facilities across the globe. Greenscapes president Sage Ralston founded the company in 2000, and he first engaged FourBridges in late 2011 because the company was experiencing significant growth and needed additional financing. FourBridges developed a financial model that predicted the capital required and contacted potential lenders. In 2012, Greenscapes closed on a $25 million line of credit. Over the years, FourBridges assisted Ralston and Greenscapes in evaluating potential acquisitions. Earlier in 2018, Ralston was approached by Hanes, and he agreed to explore a change-of-control transaction, with the priority of seeing that his employees would be taken care of and that he was getting appropriate value. He then engaged FourBridges to advise him in positioning the company as favorably as possible; to recast the financials; and to negotiate the terms and structure of a transaction. A term sheet was eventually presented by Hanes, and after negotiations, a Letter of Intent was signed. According to Jerry Greene, the president of Hanes Companies, the acquisition is an important milestone in his company’s strategy to grow its presence in retail distribution, and both Hanes and Leggett & Platt are committed to growing their distribution network. About Greenscapes Home and Garden Products, Inc.: Based in Calhoun, Ga., Greenscapes Home and Garden Products, Inc. designs and sells innovative home and outdoor products, including landscape fabric, edging, frost protection, bug zappers and bio-fuel products. The company, founded in 2000 by current president Sage Ralston, markets to Lowe’s, Home Depot, Wal-Mart and other big-box retailers. About Hanes Companies, Inc.: A division of Leggett & Platt, Hanes Companies, Inc. is a diverse supplier, converter and distributor of a variety of products and services in multiple markets across North America and Europe. With over 90 years in the industry, Hanes provides a wide spectrum of woven and non-woven industrial materials to end markets including automotive, bedding, building products, furniture, geosynthetics, landscape and packaging. About Leggett & Platt, Inc.: Publicly traded on the NYSE, Leggett & Platt, Inc. (LEG) is a $4 billion revenue company with a market capitalization of $5.9 billion. Founded over 135 years ago, Leggett & Platt designs and produces engineered products found in most homes and automobiles. The company is comprised of 14 business units, 22,000 employee-partners, and 120 manufacturing facilities located in 18 countries.